The Rjukan area of Norway boasts some of the best ice climbing in the world. Easy to access canyons and awe inspiring multi-pitch frozen waterfalls provide almost unlimited challenges for beginners to intermediate climbers alike. The CADETNORICE expedition is a 6-day introduction to climbing in winter environmental conditions (snow and ice). The content includes clothing and equipment, winter mountain hazards, weather, rope management and knot tying, belaying techniques, multi pitch winter climbing using ice climbing tools and crampons up to grade 2/3, abseiling, setting up anchors and ice screw placement. The outcome of the CADETNORICE course is for the candidate to achieve the IWC award and be a competent second on a multi pitch winter (snow and ice) climb. The Canadian Rockies boasts some of the best ice climbing in the world. Easy to access canyons and awe inspiring multi-pitch frozen waterfalls provide almost unlimited challenges for beginners to intermediate climbers alike. The CADETCANICE expedition is a 9-day introduction to climbing in winter environmental conditions (snow and ice). 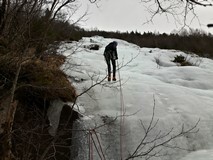 The content includes clothing and equipment, winter mountain hazards, weather, rope management and knot tying, belaying techniques, multi pitch winter climbing using ice climbing tools and crampons up to grade 2/3, abseiling, setting up anchors and ice screw placement. The outcome of the CADETCANICE course is for the candidate to achieve the IWC award and be a competent second on a multi pitch winter (snow and ice) climb.